With Wholesome Pro you can track several types of Omega 3's from foods, including: a-Linoleic Acid (ALA), EPA, DHA, and DPA. Wholesome also tracks Linoleic Acid, an Omega 6. To track your intake of Omega 3s, simply track what you eat and then go to the 'My Nutrition' page to track your progress. Scroll down to the "Steroids & Omega Fatty Acids" section and try to get to 100% for each nutrient. Make sure your profile is set within settings. The app will then adjust your goals according to the USDA recommended amounts for your personal attributes. If you'd like to set your goal higher, you can modify your daily goal within settings. Note: EPA, DPA, and DHA do not have USDA recommended guidelines for intake and so the app calculates these in grams instead of percent. 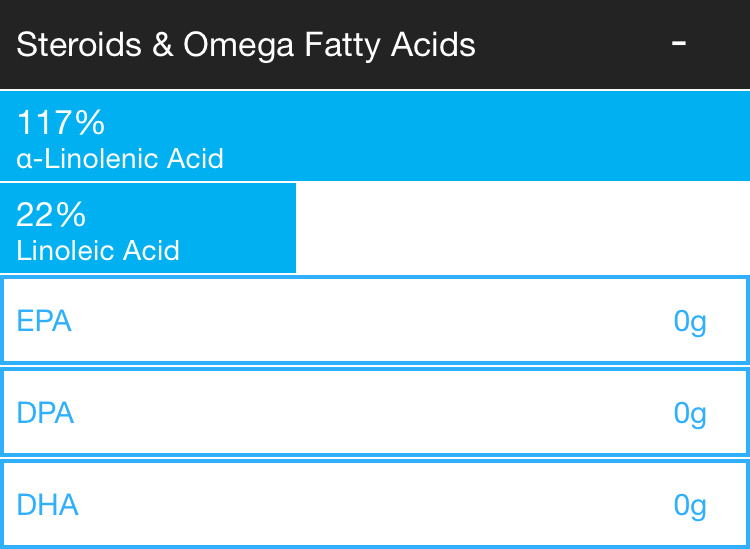 You can use Wholesome Pro to track and make sure you're getting enough Omega 3s in your diet. With 80+ nutrients, Wholesome Pro has the most comprehensive nutrient database available for tracking, including macronutrients, vitamins, minerals, phytonutrients, antioxidants, and omega 3s. Wholesome Pro allows you to easily identify gaps in your nutrition and suggests whole foods to improve your diet. It will also warn you when you’ve had too much sugar, fat, or sodium.